The Worst Learner Made By: Jaslen Guzman Click to Start Clip. 3 In the old location of Crabley Town there was a girl about 10 years old. She isn’t just any ordinary 10 year old though… Valerie Shabey was the most worst learner in HISTORY! She got distracted so easily and always talked back to the teacher. Also, Valerie disobeyed her mother, father and older siblings. If you tried to talk her out of something it’ll have to take all your life to persuade her! In other words; if you told Valerie not to do something, she would go right out and do it. 4 One day Valerie was sent to school by her mom. So she obeyed (unlikely for her), walked to school, settled down at her desk and waited. Mrs. Karina was standing there in the middle of the room and asked for everyone’s attention. Excuse moa! Hello… I want everyone’s eyes on me. Well then, Mrs. I-want- everything you get my attention when I give it to you m’kay? 5 So the teacher (daily) told Valerie to… Valerie, how many times do I have to tell you NOT TO TALK BACK TO ME? You are really making me so, so, MAD! Sorry for interrupting, ha, ha never mind I’m not sorry, but isn’t it illegal to GIVE ME ATTITUDE?! I don’t have attitude going on here do I? Because I will serve attitude if that’s what it takes ok old lady?! 6 Ok, ok don’t rush me I’m taking my time. I’m going to walk out like a model ! Valerie please make my day by meeting me in the hallway ok? You are wasting your classmate’s time here, so go on and waddle your little behind on down! 7 Valerie, why are you acting like this? Why? Is it because you want attention? No. I am always telling the truth when I what you call, insult you! Why is it so hard to accept? 8 And in that moment, Mrs. Karina exploded with anger! She did with every complex part of anger too!!! 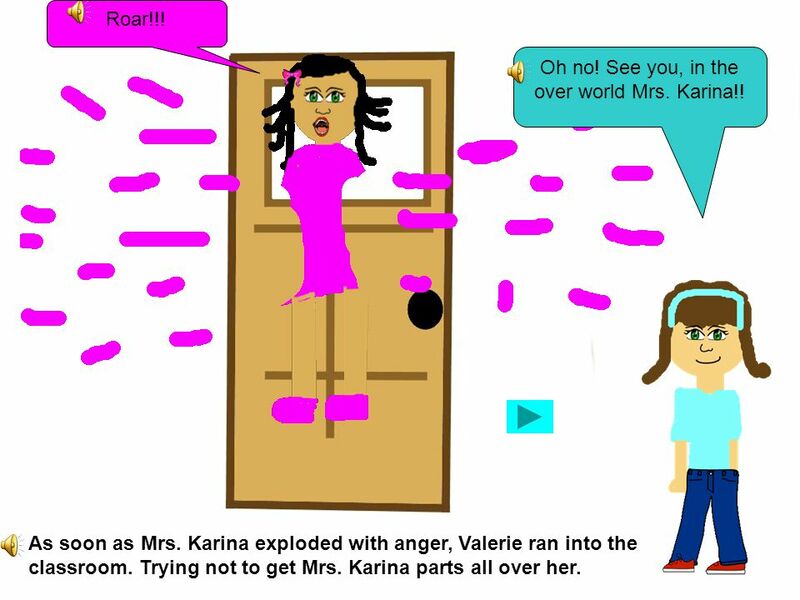 9 As soon as Mrs. Karina exploded with anger, Valerie ran into the classroom. Trying not to get Mrs. Karina parts all over her. Roar!!! Oh no! See you, in the over world Mrs. Karina!! Download ppt "The Worst Learner Made By: Jaslen Guzman Click to Start Clip." Illustrations By: Stephanie Torres & Kiara Renderos. By Eloise king Click me. 1.Fighting 2. Playing 3. Trying again 4. Arguing 5. BBF’s 6.The end 7.Eloise King 8.The Blurb Click me.